Increasing pressures on the sea make it all the more pressing to protect the seas from the consequences of human activity. The need to better understand the ocean system and the human-ocean relationships, is urgent if the pressures on the marine ecosystems are to be reduced and the development opportunities offered by the ocean are to be seized in a sustainable way. While the functioning of the ocean and the human-ocean relationship remain poorly understood, knowledge has improved in recent decades. Initiatives have also been developed to gather all available knowledge on the ocean and improve the use of available knowledge by different stakeholders. The concept of Ocean Literacy was first defined in the U.S. as “an understanding of the ocean’s influence on you – and your influence on the ocean” West, 2004). It has no translation in other European languages but is approached by terms referring to environmental education, awareness raising, communication and information. Research shows that people’s behaviors do not depend solely on knowledge they have but also on several other factors as socioeconomic conditions. The H2020 EU project ResponSEAble aims to support the emergence of an effective and dynamic ocean -knowledge system that contributes to raising awareness of the benefits of a healthy and productive ocean. ResponSEAble is mapping European marine research and knowledge to deepen our understanding of complex human-ocean relationships. The project investigates links between ocean protection issues in Euro2pe and the economy as a whole. The project has also developed methods to document the level of knowledge and perceptions of European actors in order to understand what improvements can be made when developing knowledge and awareness-raising products regarding the oceans. The project is also working on a raft of exciting media and outreach activities including films and film making competitions, an educational computer game and other learning materials, a social media campaign and an interactive website. The project’s media outreach aims to connect with a wide range of audiences. By generating greater public debate and knowledge, ResponSEAble intends to support all sectors of European society to develop a more informed and responsible attitude and help secure healthier and more sustainable oceans. In the Atlantic region, ResponSEAble is exploring the human-ocean relationships in the areas of microplastic and cosmetic, sustainable fish and marine renewable energy. 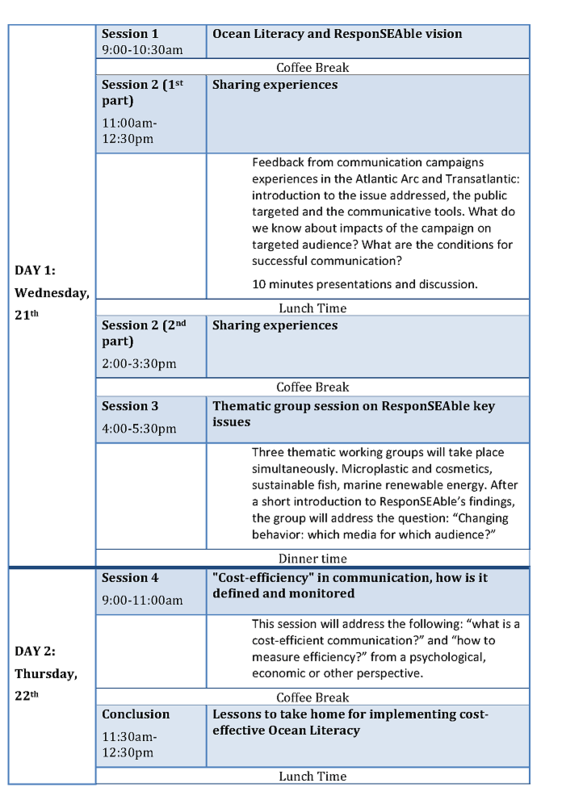 The Atlantic Arc workshop is co-organised by the EU-funded ResponSEAble research project (for more information, see: http://www.responseable.eu/). It takes place within the wider context of the Atlantic Action Plan and the objectives and actions carried out by the Atlantic Stakeholder Platform (http://www.atlanticstrategy.eu/en). The workshop is open to people in charge of education, awareness raising and other means to develop Ocean Literacy in research and education institutions, NGOs, industry bodies, international organizations and management or policy-making bodies. If you are interested, please, submit a short abstract (5-10 lines) for a ten-minute presentation of a communication action before June 2017, 9th. Presentations should be case-based and focus on type of message, target audience, media for communication and reasons for more or less successful achievement of the objectives. Presentations will be the core of session 2. The number of attendees is limited to 25. Please, contact us early to save your place. We expect to get about 10 presentations followed by discussions. The workshop will be held at the « European Institute for Marine Studies » (IUEM) in Brest, France. Workshop presentations and discussions will be in English. Lunch and dinner are offered by the conference organisers.